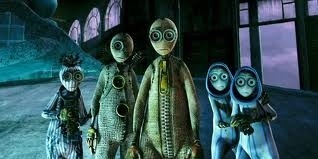 Voices: Elijah Wood, Christopher Plummer, Martin Landau, John C. Reilly, Jennifer Connelly, Crispin Glover. These days kids are spoiled with an endless supply of high quality animated films. As a nipper I was content with an episode of “Thundercats” but the beauty of modern film animation is that some are aimed at adults also. This happens to be one that falls into that category. 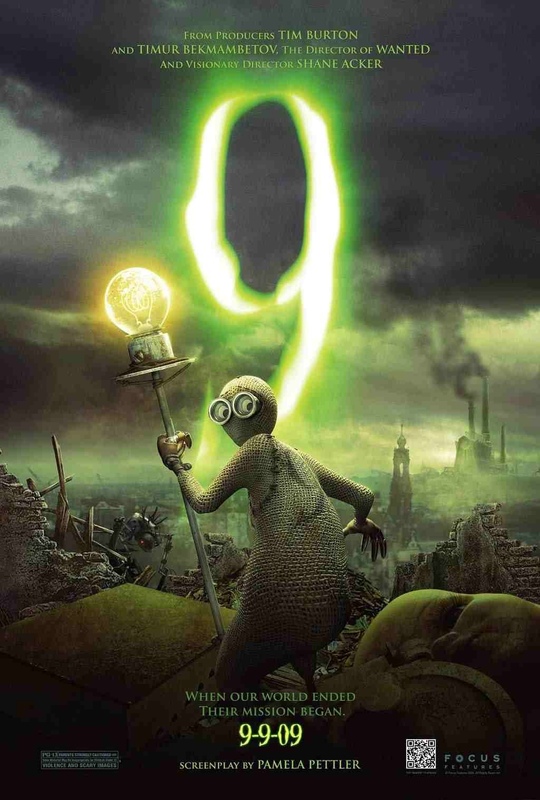 In a post-apocalyptic future, sackcloth doll numbered “9” (Elijah Wood) wakes up to find that human beings have been eradicated from existence. As he explores the desolate land, he finds a small society of his handrafted kind struggling for survival against terrifying machines. Self-proclaimed leader “1” (Christopher Plummer) keeps his troops in hiding, but when “2” (Martin Landau) is abducted, “9” convinces them that they must attack to survive. Along the way they discover evidence from their deceased creator that they personally hold the last of what’s left of the human soul and preserving themselves is to preserve humanity. This animated feature has had it’s fair share of criticism but at a running time of 1hour 19mins it’s hardly a massive commitment. In fact, I found it to be quite a pleasure. Where the criticism has been directed is in the story. Too shallow for adults and too dark for kids apparently. Granted, the old tried and tested post-apocalyptic earth, where silly humans have gone and eradicated themselves again, is nothing new and a bit tired, but this is just a vehicle for director Shane Acker’s imaginative little creations to come to life. And come to life they do. The animation is absolutely striking and each little hand crafted ‘stitchpunk’ is given individuality with painstaking attention. The emotional depth and expression of such similiar designed little characters is stunning. I found them very appealing indeed, and a pure joy to watch them on their adventure. This originally began as an 11minute short film (also called “9”) that director Shane Acker won an Academy Award for in 2005. This Oscar success obviously drew the attention of producers Timur Bekmambetov and Tim Burton who have indulged Acker’s vision with money, allowing him to elaborate on his story, and thankfully for us they did. This is animation at it’s finest and on a par with the best that Pixar have produced. I’m very surprised at the criticism this little gem has come in for as this is a deep, beautifully realised science fiction yarn and a post-apocalyptic world that I hope to visit again soon. A pure visually arresting delight. This entry was posted on January 29, 2012 at 4:04 pm and is filed under Adventure, Animation, Fantasy, Science Fiction with tags 2009. You can follow any responses to this entry through the RSS 2.0 feed. You can leave a response, or trackback from your own site.